Public news media play a prominent role in Western Europe. 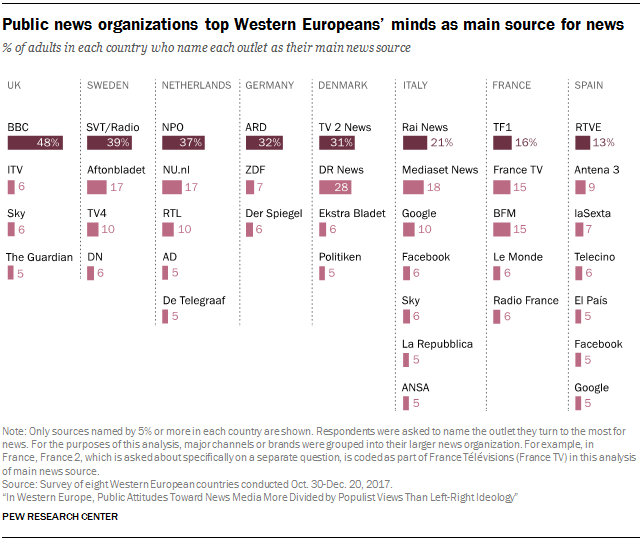 In seven Western European countries surveyed, the top main source for news is a public news organization – such as the BBC in the UK, Sveriges Television/Radio (SVT/Radio) in Sweden or ARD in Germany – rather than a private one. This is in strong contrast with the United States, where the largest public news outlets, NPR and PBS, rank far lower than many of the country’s private news outlets. In the UK, Sweden and the Netherlands especially, adults are attached to their public broadcasters, according to a Pew Research Center survey conducted across eight Western European nations. About half of British adults (48%) name the BBC as their main source for news, 39% of Swedes name SVT/Radio and 37% of Dutch adults name Nederlandse Publieke Omroep (NPO). Publicly funded news media also tend to be more trusted than privately funded organizations – both in general and when it comes to specific news outlets. For example, about three-quarters (73%) of Swedes and 71% of British adults say they trust the public media more than private. In Spain and Italy, publics are more divided on the issue. Beyond general trust, the survey also asked respondents about eight country-specific, individual news sources, including the major publicly funded news organizations in each of the eight countries. If they had heard of an outlet, they were then asked if they trusted or distrusted it. The data show that at least nine-in-ten in each country are aware of the public news entity or entities. 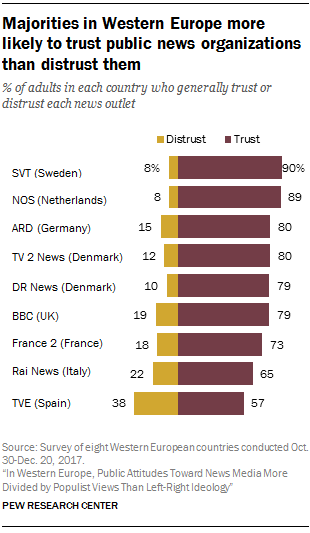 And, the trust levels for each are among the highest for any of the eight outlets asked about in each country. At the higher end, for instance, 90% of Swedes and 89% of Dutch adults say they trust their respective public broadcaster. Italians (65%) and Spaniards (57%) also trust their public news media more than they distrust them, but to a lesser degree than their European counterparts. In Spain, even though a majority trusts the public broadcaster, Televisión Española (TVE), slightly more people (64%) express trust in the private television outlet Antena 3. For most other countries, trust in the public news entity is higher than for any private outlets asked about. Populist sympathies in the countries surveyed are a more consistent divider than left-right political identity, when it comes to trust in public news media. This is in line with other findings in the main report on news media attitudes and habits in Western Europe that also reveal sharper divides based on populist views than left-right ideology. In all eight European countries studied, those who embrace populist views are less likely to trust their public news media than those who do not espouse these views. (Populism is defined in this study as the belief that ordinary people would do a better job solving their country’s problems, and that most elected officials are indifferent to “what people like me think.”) The trust difference between those who hold populist views and those who do not ranges from a low of 9 percentage points in Denmark to 30 points in Spain. A left-right ideological divide in trust of public news organizations also shows up in five of the eight countries. In four of these five countries, the differences are about equal to or smaller than those based on populist views, ranging from 8 percentage points in Sweden to 14 points in Italy. Spain is the exception: There, the left-right difference is larger than the divide based on populist leanings – 74% of right-aligned adults in Spain trust TVE compared with 32% of left-aligned adults, a 42-point difference. Note: Newly released topline results can be found here (PDF). See also Appendix A (list of the eight outlets in each country and how they were selected), Appendix C (how the study defines and measures populism), full methodology and previously released topline results (PDF).